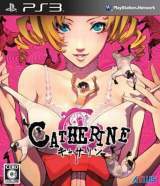 Catherine © 2011 Atlus Co., Ltd. Released on February 17, 2001 in Japan. Ink & Paint: Yuka Ohno, Kimihito Kubo, Siori Furusyo, Studio L, Office Fu-u, Sunny-Side Up, Rocket Vision Inc., A-Line, T2studio, J.C.STAFF Co. Ltd., Rising Force Inc., M.S.C, Studio Step, Assez Finaud Fabric, Defa, TripleA, Brain's Base, Production I.G, D-COLORS, PRODUCTION REED Co. LTD.